If you've always wanted a Fender Jazzmaster, but haven't got the money to buy a real classic player, or vintage model, then the Squier J Mascis Jazzmaster is probably the closest that you're going to get to the real thing. 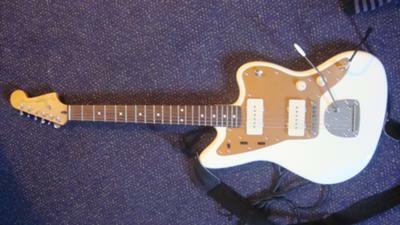 There are other cheap versions such as the Vintage Modified and the Black Tops, but they don't look like the real Jazzmaster or share all of it's features. This guitar has near enough sound quality of the Black Top series, and slightly brighter tones than a classic Jazzmaster. 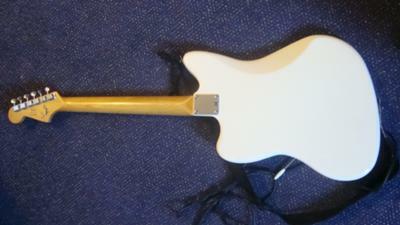 Only it's cheaper than a Black Top, partly because it's under the Squier name and not Fender. It includes a rhythm and lead circuit as well as a pickup switch, allowing you to explore tones, and a tremolo, features that the Vintage Modified lack. The only difference is the bridge, which has been swapped for a tune o matic, rather than the standard Jazzmaster bridge which can be difficult to set up. This guitar is unbelievably good value for what it is. I have had no problems with it and play it in it's factory settings. 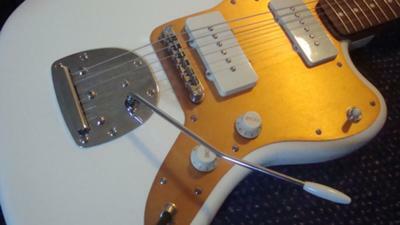 Probably one of the best alternatives to real fender out there, and the colour is beautiful. Even experienced guitarists with higher budgets are drawn to this guitar. Join in and write your own page! It's easy to do. How? Simply click here to return to Gear Review.